Science plus gardening gives us the “Life Lab”, where students can observe with their own eyes the concepts they learn in science class. 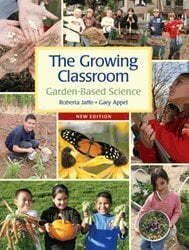 In this book, Roberta and Gary have provided more than 150 field-tested, garden based activities that will get students outside observing our world’s natural rhythms while potentially sparking a scientific interest in them that will never leave. There are so many life-lessons to be learned from gardening, and this book will give teachers creative ideas on how to get their students interested in gardening, ecology, biology, and even nutrition.